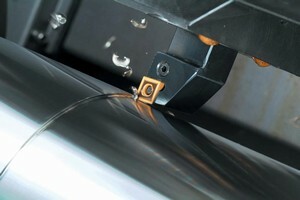 Grades suit steel cutting applications. Featuring polished insert faces and cutting edges, AC610M and AC630M grades combine advanced substrates and wear resistant Al2O3 and TiCN coatings. Designed for general cutting of stainless steel, AC630M is resistant to peeling and notch wear, while AC610M exhibits plastic deformation control and wear resistance in high speed applications. Both models are available in positive and negative insert styles. Mount Prospect, IL - (July 11, 2006) Featuring polished insert faces and cutting edges, Sumitomo's new AC610M and AC630M grades turn stainless steel and steel with unprecedented accuracy. Each grade combines advanced substrates and wear resistant Al2O3 and TiCN coatings for longer tool life and increased productivity. An excellent choice for the general cutting of stainless steel, the AC630M offers exceptional peeling and notch wear resistance. Featuring superior plastic deformation control and wear resistance, the AC610M is ideal for applications requiring high-speed and high-efficiency cutting. Customers are already seeing the results of these new grades. In an application example using 15-5PH stainless steel at 36-40Rc, running at 600 SFM, Rockford Burrall achieved 0.141 DOC and 0.014 IPR. "When we switched from a competitor insert to the AC610M, we realized a 50% increase in tool life," stated Dave Haselton, Lathe Department Supervisor, Rockford Burrall. Both the AC610M and AC630M grades are available in positive and negative insert styles. For more information, visit our IMTS 2006 Booth #E-2136 or contact Sumitomo Electric Carbide, Inc., 1001 Business Center Drive, Mount Prospect, IL 60056, Phone: (800) 880-0619 , Fax: (847) 635-9335, e-mail: info@sumicarbide.com, or visit www.sumicarbide.com. For: Sumitomo Electric Carbide, Inc.